Now I kind of like Malachi – always have. There’s something about his terrier quality, his pint-sized spunkiness that appeals. And agree with him or not, he can write – a gift not always possessed by the clergy-assaulting ranks to which he belongs. But he’s full of the brown stuff on this one because his argument is based on one presumption: that Fr James Chesney was involved in the Claudy bombing and other violent activities. There’s no evidence of that. There’s the word of a Special Branch officer who claims that he was all set to raid Fr Chesney’s home when his superiors pulled the plug on it. There are RUC claims, reported by Al Hutchinson, that say Chesney was actively involved in IRA operations. But nowhere does anybody produce a fragment of evidence that Jim Chesney was involved in a single violent act. And yet several times in the course of his article Malachi lashes both Cardinal Conway and Sean Brady for their response to the Chesney affair. 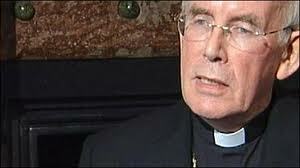 Cardinal Conway was guilty of ‘a gross violation of innocence’. He (Malachi, not Cardinal Conway) declares Fr Chesney to have been ‘a murderer’, ‘a mass murderer’ and insists Cardinal Conway knew this to be so. And he (Malachi, not Conway or Brady) believes Brady should have resigned long ago if, well, if he doesn’t agree with Malachi about child abuse as well as the Claudy case. Was Fr Chesney a member of the IRA? I don’t know. Neither does Malachi. Thousands of young men at the time were members of the IRA. But whether Jim Chesney was or was not, no one is entitled to get on a high moral horse and declare him a member, let alone a mass murderer, except they can adduce evidence to support their claim. That’s what a system of law – innocent until proven guilty – is about, and that’s what moral integrity as distinct from moral relativism demands. You’ll notice that on several occasions above my syntax became so clotted, it may have seemed I was talking about Malachi when I was in fact talking about William Conway or Sean Brady. So it’s just as well I didn’t borrow the title of Malachi’s article for this piece, or the confusion between the two clergymen and Malachi might have deepened. The title of Malachi’s piece was ‘A Moral Dullard’. The distinguishing mark of modern society, G K Chesterton once wrote, is a hatred of religion. If that was the case more than 100 years ago, you could magnify it 100 times over for today. Hatred is the crucial word. Not apathy or indifference, but a violent reaction of the type that can lead to intemperate, illogical language even from clever people. Such language was to be heard again this week following the report that a Catholic priest, Father James Chesney, had been suspected of organising an IRA bombing that killed nine people, some of them Catholics, in the village of Claudy in 1972. Here was yet further proof of the iniquity of the Church following hard upon the scandal of the child abusers. Any believer, Catholic or no, will have found it profoundly shocking that a priest could have organised the taking of innocent lives. But no one, as far as I could see, considered it so shocking as to be improbable. It was pointed out that it was a long time ago and that Father Chesney was dead, but those of us who remember the events in Ireland in the early 1970s remember the endless saga of false accusations, the multiple cases of miscarriage of justice, the internment of countless innocent Catholics, the dirty tricks campaign pursued by British intelligence, etc. That does not mean the accusations against Father Chesney are false, but I would have been more inclined to believe them if they amounted to more than just accusations. Mere suspicion will be enough for the God-haters, but we believers, remembering what happened before, would welcome something a little more substantial before we condemn. Taken from Richard Ingrams in the Independent. The sad thing in all of this is the fact that Mr Chesney is unable to defend himself but then when has that stopped so called 'political commentators' making baseless accusations? In hard-hitting comments aimed at senior party figures, Mr McCrea will say: “For far too long this party, the party for all its faults we cherish has been choked by a culture of cronyism, of rule-bending intellectual poverty. “We have been dogged by would-be leaders; behind the scenes, string-pulling unelected leaders and responsible-to-no-one leaders. “Our message to the public has been blocked by too many voices and too many self-promotional messages. Tonight Mr Elliott's campaign manager, Mike Nesbitt will be one of seven individuals hoping to be selected as one of three (eventually to be reduced to two) candidates to run in Strangford in next year's assembly election. Veteran UUP MLA David McNarry, who is also backing Tom Elliott, is also standing, as is businessman Bill McKendry, party officer Phillip Smith, former Ards mayor Jim Fletcher, long-standing Ards councillor Ronnie Ferguson and Andrew Cooper.